SUNDAY, MAY 26, 2019 at 2:00 P.M. PLEASE NOTE: due to the special nature of this Puja, late entries will not be allowed. To minimize the Center’s impact on our neighborhood, please park on West Amazon and walk up hill to KDC. On Sunday, May 26, during the Memorial Day weekend, Venerable Lama Tsang Tsing and KDC’s western Lamas will perform a special, extensive Puja for the deceased. Ven. Lama Tsang Tsing has chosen this date for the Puja since Memorial Day weekend is a time when we traditionally remember our loved ones who have passed away. This Puja is extremely helpful when performed for the benefit of one who has died. After dying, due to karma and habitual patterns, we have no control over our future rebirth, and we are driven by the power of our previous actions. This profound Puja purifies negativities and obscurations and liberates the deceased from samsara, leading to rebirth in the Pure Land of Dewachen. 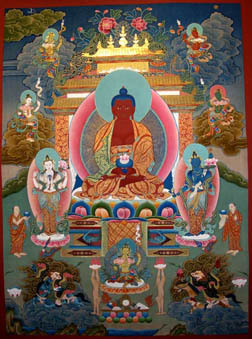 This special Amitabha Puja is traditionally performed in monasteries and homes in India, Tibet, Bhutan & Nepal, however it is rarely performed in the West. Due to the training and ability Venerable Lama Tsang Tsing has to perform this profound Puja, Kyabje Bokar Rinpoche requested the Puja be performed on a regular basis to benefit beings in the Bardo. Names of deceased and donations may be submitted for this special Puja by anyone who has had a family member or friend pass away, whether the death is recent or long ago. It is traditional to make a monetary offering along with the names in order to accumulate merit and welfare for the deceased. Due to the auspicious nature of interdependence, there is a direct relationship between donations made on behalf of the deceased and the benefits the deceased person receives from the Puja. The names of the deceased are burned during the Ceremony by Venerable Lama Tsang Tsing to purify their negativities and defilements so their path to Dewachen will be unimpeded. We are very blessed to have Venerable Lama Tsang Tsing performing this rare and profound Puja for our loved ones.